Next Thursday, get ready for two romantic Bates storylines coming your way on an all-new, one-hour episode of Bringing Up Bates. 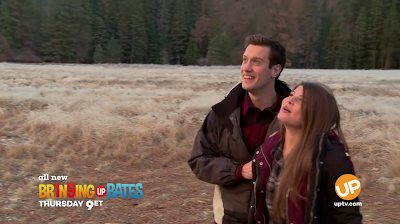 Tori and Bobby Smith enjoy their first days as a married couple with a trip to Yosemite. And back home in Tennessee, Josie Bates and Kelton Balka take a step that will bring them even closer to the altar. Check out the sneak peek video below. Looks more like a marriage proposal than a courtship. Save the getting down on 1 knee for that. I do agree these courtship proposals are very elaborate. Kind of silly actually. My theory is first it’s for tv. It brings in ratings. Second, they don’t get to go to school dances, no proms, no dates, no going to movies etc. They put all their effort into 2 big events. Courtship and Wedding. Their engagements are short so usually these young people have 1 year of their lives to be the center of attention. Once they are married a new center of attention comes forth. They do it big for that one year. 8:14. I think you summed it up accurately. Let them have their year. Erin and Zach commented awhile back on how elaborate these courtship proposals have become. Erin said something like, "We went out to a resteraunt!" Of course it has to do with the family now being television celebrities but lets face it - the audience enjoys it so who cares if some people (including me) think the courtship proposals are over the top. A lot of non christian people watch this show so it makes for a good testimony for purity. Wow Carlin and Josie getting married soon! More grandchilderen for kelly next year. Do you know how many more episodes are left? It's slated to be the longest season yet, so there are still plenty of new episodes on the way. Please UP give us something else besides courtship/engagement/wedding/baby!!! You sound like just like everybody who is on the Duggars Facebook pages. If you like don't like the show change It simple as that. The Duggars do the same you are here complaining about this. Like I said If you don't like the show change It to a different channel. Josie is still to young to get married I hooe she waits tell next year. I think Josie is mature beyond her years, so when the time is right she and Kelton will know without the outside opinion of strangers. Maybe it's me but don't you find having TV cameras and a TV crew following you around on your honeymoon a BIT intrusive? These young people are very sheltered and sequestered from any type of relationship before marriage. I would think it's a big deal to be married so quickly and 'alone' with a male or female in the first place. Why would they have people go along with them on a honeymoon just doesn't make any sense to me. Not private. I am sure they have plenty of private time. Having the crew film for an hour or so of their day isn’t much work. It isn’t like they are showing them in their hotel room or cabin or wherever they are staying. If they are out seeing the park, anyone can see them anyway, so why not get paid? Tori and Bobby were together for a long time before marriage, so they didn’t marry quickly. I agree with you it isn't private. The reason they allow cameras is that they are getting paid. It's a work trip for them and they also get to enjoy the location. There are times when they aren't being filmed and can just unwind together. I wouldn't be surprised if the couples have a second, private honeymoon to celebrate their marriage. I know the Duggars and Bateses are different families, but Joy and Austin went to Israel on their own after their TLC honeymoon. 9:56 Jinger and Jeremy's room was shown when the crews followed them. Agreed. I think the crew goes along because UP is paying for all or part of the wedding / honeymoon. Which is great if you don’t mind being followed on your honeymoon. I assume every couple makes decisions about how much of their privacy they are willing to give up. Tori and Bobby did let a camera film their first moments alone together, but I don't recall a similar scene with Michaela and Brandon. Also, while they are not Bates, many Duggars who have married have allowed for some, but not all, of their honeymoons to be filmed. Joy/Austin had both a "public" honeymoon in Switzerland and a "private" one in Israel. And Jinger/Jeremy had the Australia portion of their honeymoon filmed but not the New Zealand part. And if you look at honeymoon footage most of it is centered around some activity likely set up in advance specifically for filming purposes. I've also read the cameras are only at the main Bates house 3 days a week. I doubt any Duggar or Bates has ever made a deal for the camera crew to be actually "following you around" 24/7. I suspect the production company wouldn't even want that expense. TV shows do NOT have bottomless budgets and it seems obvious to me UP has less of a budget than TLC. No Bates has had an international honeymoon televised, at least not yet. Maybe by the time Josie or Carlin marry there will be enough in the show's budget for that. I wonder if these couples (Duggars included) spend a few days together on their honeymoons before the tv crew shows up? I hope so. Yes, they do. The newlyweds always stay in a hotel not too far from their home for the first couple of nights before flying out to their honeymoon destination. And there is no camera crew until they reach that destination. Jinger and Jeremy stayed in a hotel for four days after they got married and then went to Australia. I cant wait to see this episode. Hope the whole hour and a half is the Bates and not previews for other shows. The Bates are an important part of our lives. We value they way they live.